We all know the by now woeful tale of Internet Explorer 6, which close to a decade after its arrival still has a significant share of the web browser market. Its users have been extremely slow to abandon it in spite of there being two newer and much improved versions of Internet Explorer freely available. And this is with Microsoft actively encouraging an upgrade. You could even argue the same for Internet Explorer 7; why haven’t the vast majority of Internet Explorer users switched to version 8 by now? This conundrum made us wonder how the other web browsers fare when it comes to getting their users to upgrade to newer versions. How quickly do Firefox, Safari, or Google Chrome users upgrade their browsers when new versions arrive? We have studied the upgrade pattern for Internet Explorer, Firefox, Google Chrome, Safari and Opera and found some drastic and quite interesting differences. Although we don’t have actual upgrade statistics, we can see how the market share for the various versions of a web browser changes, and that is good enough for our purposes. We used data from StatCounter, who provide browser statistics based on tracking of approximately three million websites globally. What’s interesting about Google Chrome is that Google has taken a very different approach to upgrades compared to other browser makers. Their mantra: Don’t ask the user to upgrade, just do it. Google Chrome handles its upgrades in a completely automated fashion, even for a completely new version of the browser. While other browsers will ask the user for approval to move from version 1 to version 2 (just an example), Chrome will just handle that in the background and move ahead with the upgrade. If you think about it, this mirrors the way web apps work, i.e. updates go through to all users so everyone is using the same version of the software. The upside of Google’s automated upgrades is user convenience and that all users will actually be running the latest version of the software, which can have positive security implications as well. The downside is that the user loses control over the upgrade process. 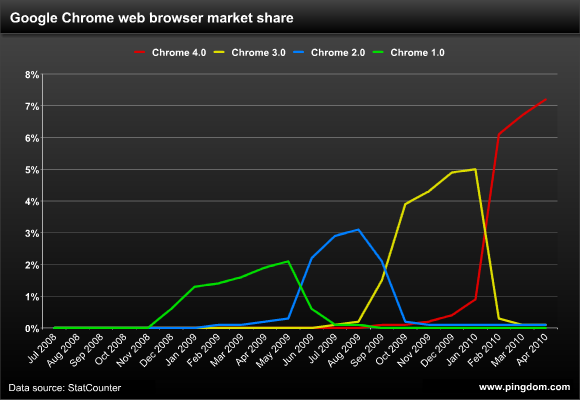 What is also apparent when looking at this chart is the rapid pace of upgrades to Google Chrome. It’s gone from version 1.0 to 4.0 in little over a year. No other browser we know of is even close to this pace. Microsoft, perhaps due to a combination of being the default browser in Windows and somewhat conservative company policies regarding browser usage, has an exceedingly slow rate of change when you compare it to the other browsers in this study. 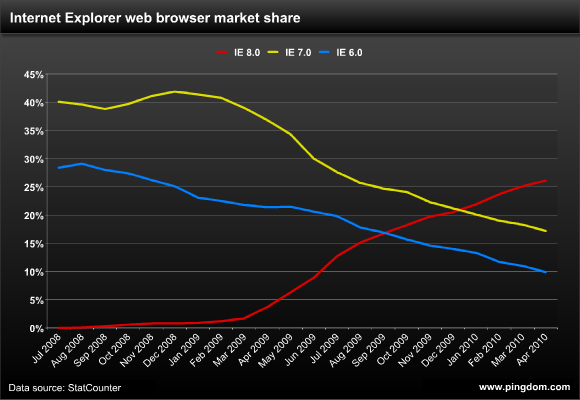 IE 6 is the last of the old generation of browsers, and it’s not going away anyway near as fast as we’d all expect. The only good thing that can be said about it right now is that it is, as of September 2009, the least common version of Internet Explorer, since that is when version 8 passed it in popularity (ok, market share might be a better word than popularity here). Compared to Chrome and IE, Firefox has managed to find some sort of middle ground in the way it handles upgrades. Upgrades are handled more aggressively than IE, but doesn’t go to the extremes of the fully automated Chrome. Minor upgrades (such as 3.6.1 to 3.6.2) are handled automatically, but the user has to approve any big upgrades (such as from 3.0 to 3.5). An interesting observation here is that it takes a new version of Firefox less than three months to overtake the previous version. 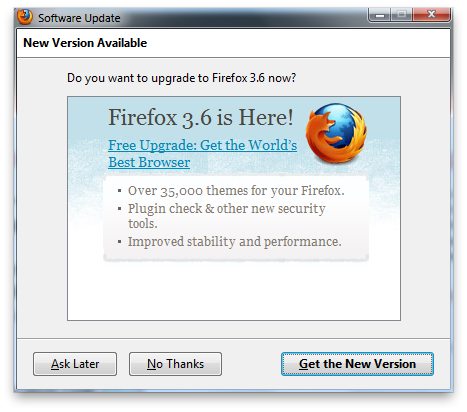 Starting today, users running older versions of Firefox will be offered the choice of upgrading to Firefox 3.6. We’re presenting this upgrade offer for our users who may not realize that a new version is available. The offer screen will only appear after 60 seconds of keyboard inactivity to ensure we don’t get in the way of anyone’s activities. If a user declines the offer and later regrets that choice, they’ll be able to get it again simply by selecting “Check for Updates” from the “Help” menu. For the sake of completeness we have also included Safari and Opera, although we won’t go into similar detail here. We’ll let the charts speak for themselves. Please note that the below chart for Opera doesn’t include the newly released Opera 10.5. The dip for Opera 10.0 that you see at the end is most likely caused by its users migrating to Opera 10.5, although that version wasn’t included in the stats we downloaded from StatCounter. The release of Opera 10.5 matches the drop perfectly, since the beta was introduced in February and the final version in March. That also means that Opera is doing a very good job in getting their users to upgrade rapidly. Different approaches to making users upgrade. Completely automated, or aggressive promotion of new versions, or a more laid-back approach? These charts all tell a different story. These browsers have different types of users. Upgrade behavior will in most cases be tied to the kind of users the browser has attracted, with IE’s slow upgrade rate partly being the effect of a user base that is what you might call technologically conservative. To name an example, only around 14% of Pingdom’s users access our control panel with IE, but Chrome accounts for 21% and Firefox for 51%. This is very different from the internet average, where IE has more than 50% market share and Firefox and Chrome significantly less, but it’s a reflection of the fact that our users consist largely of webmasters, sysadmins, web designers, and site owners. In this case, Firefox and Chrome has attracted a more tech savvy audience (on average), which may be more inclined to upgrade to the latest version quickly after it arrives. 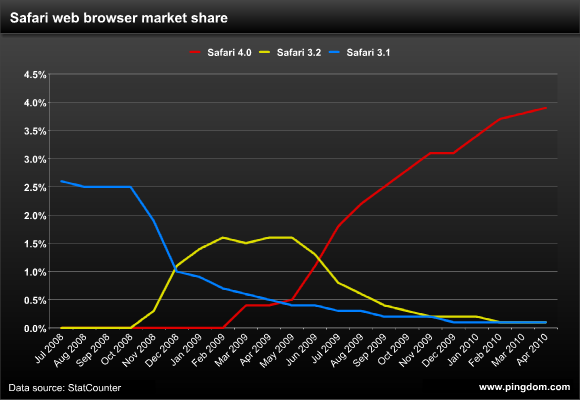 The share of technical users each browser has will affect the upgrade pattern. Web browsers are among the most widely used applications in the world and even those of more modest popularity like Opera have a huge user base. When it’s time to upgrade to a new version, they have to convince millions of people to do so. Google is an extreme example of pushing upgrades out to everyone. Although there will be people who criticize their approach with automated upgrades, Google’s strategy has a lot of merit, and most users are bound to find it quite convenient. Getting users to upgrade to the latest version isn’t just good for the users, it also has plenty of positive side effects for the browser developer. An obvious benefit is that with just one version out there, or close to it, the support burden should diminish significantly. The future will tell if more developers switch to the approach Google is using with Chrome. It is obviously working very well for them. Suggested further reading: Does Internet Explorer have more than a billion users? Are you working under administrator account? On my system (Vista) Firefox does not updates itself under limited user. I have to go website and download it manually each time, thanksfully I have Opera and it handles updates very wekk. I love Google’s aggressive upgrade strategy with chrome even though some of the last few builds have been very crash-prone. As a web-developer, still having to work on IE6 at times is very painful. If I just had to code for modern browsers, my productivity would easily double. Good article, some interesting points in there. I would be interested to see a merged graph that contains all of these data points. That would give the benefit of a) better conveying relative market shares and b) show how releases/upgrades of browsers effect users of other browsers. 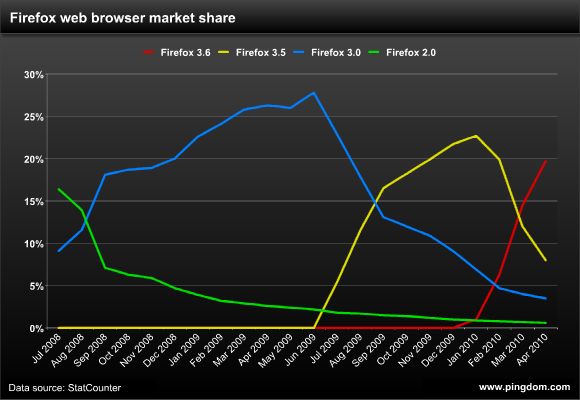 For example, you might be able to infer how the release of Firefox 3.6 impacted market share for Internet Explorer. The opera graph is completely inaccurate as the latest opera versdion is 10.5 and it is not on the graph. I actually find there is another (and to me it is the ONLY) downside to Chrome’s automatic updating: the hogging of system resources. I don’t so much mind lack of control over the update process, as I do lack of control over the WHEN of the update process. I love the upgrade approach Firefox has with browser updates, but I don’t mind the aggressive updates from Chrome either. The upgrade strategy adopted by each browser may also reflect the environment in which it is most used. Many businesses build applications around particular browsers (usually IE?) and only guarantee compatibility with certain versions of particular browsers. We have often found that users upgrading to IE8 find they no longer have full functionality in some core business processes because the in-house developers or 3rd party developers have not caught up yet. Automatic and mandated updates would leave a lot of businesses floundering when this happens. I know of users stuck at IE7 until other apps catch up! Being older and more established, I suspect IE has its roots deep into other applications in ways that (for example) Chrome does not. I stopped supporting IE6 and that’s good (at least for me). The upgrade strategies differ from browser to browser. Automatically updating is for me the easiest way. While I don’t consider google’s approach a bad idea for the general user it might be problematic for what you call, “the techie”, due to the impossibility of using plugins that might be instantly outdated when the new version comes out. This is why some people cricized firefox’s continuous updates. If you couldn’t use those handy add-ons you’d been using, what was the point of upgrading? (yes, I know about security flaws, I’m just illustrating the point). Some people chose to NOT upgrade and I think it’s only fair they get the chance to do so.